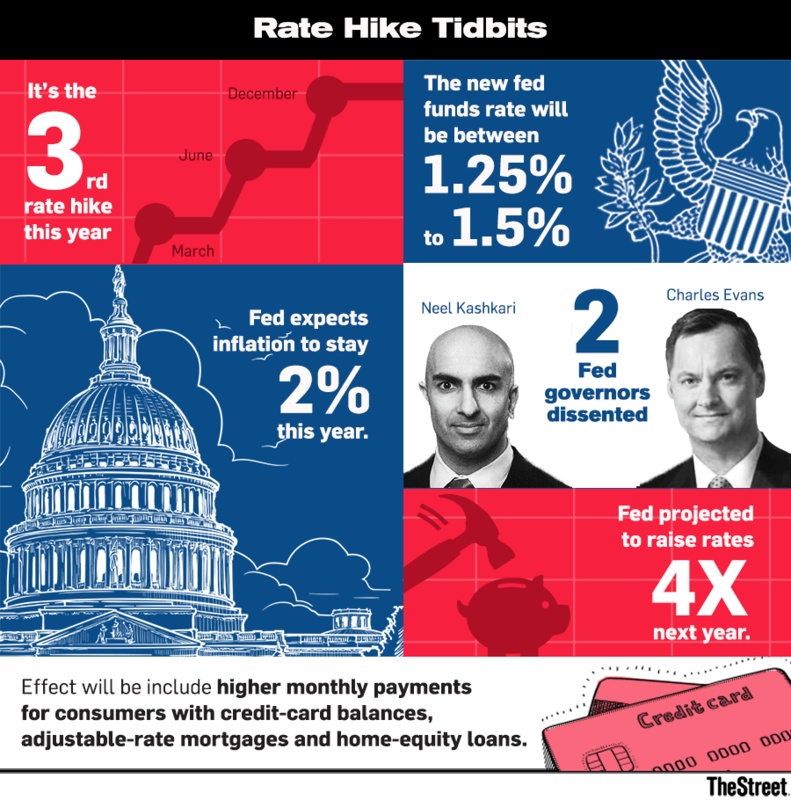 The Federal Reserve raised interest rates for the third time this year, pursuing a path of normalizing monetary policy following the unprecedented stimulus deployed in the aftermath of the 2008 financial crisis. The Fed, led by Chair Janet Yellen, increased its target borrowing rate by a quarter percentage point, or 25 basis points, to a range of 1.25% to 1.5%, according to a statement. The central bank has surprised investors, at least relative to the expectations a year ago, by increasing rates at a steadier pace than in prior years. The Fed also is moving forward with a plan to shrink its balance sheet by reducing its holdings of Treasury bonds, accumulated during the post-crisis years as a way of pumping more money into financial markets and artificially lowering long-term rates by creating more demand for the securities. Traders now will turn to the question of how many times the Fed will raise rates in 2018, and whether the economy can hum even as the central bank tightens monetary conditions. Goldman Sachs Group Inc. (GS - Get Report) and Deutsche Bank AG (DB - Get Report) say the Fed could raises rates as many as four times next year. History shows that a steady string of Fed rate increases often end in recession and a big market correction. Bank of America Corp. (BAC - Get Report) analysts have warned that stocks could rise through early 2018 and then proceed to drop. Economists at the firm wrote in a report this week that "there is no such thing as a painless Fed hiking cycle." The immediate effect will come in the form of higher monthly payments for consumers with credit-card balances, adjustable-rate mortgages and home-equity loans, all of which typically carry variable interest rates, according to Greg McBride, chief financial analyst at Bankrate.com. And that's to say nothing of corporate borrowers with floating-rate loans. "The financial markets and the economy got used to low interest rates for so long," said Peng Zhou, senior managing director at Sun Life Investment Management, which oversees $56 billion of assets. "To move away from that, even just gradually, I'm not so sure how the economy or market will take it." Incoming Fed chief Jerome Powell. This week's meeting is Yellen's last before she turns over leadership of the Fed to Jerome Powell, President Donald Trump's pick to serve as chair. Yellen leaves with growth on sound footing, unemployment at a 17-year low and inflation edging toward 2% for the first time since the financial crisis of 2008, seen as a healthy indicator for the economy. The tax cuts now being pushed through Congress could deliver additional growth that could further strengthen the Fed's resolve to keep raising rates -- to keep the economy from overheating and inflation from spiraling too high. "Changes to tax policy will likely provide some lift to economic activity in coming years," Yellen said at a press conference in Washington after the rate decision was announced. She declined to quantify the boost, though she did say that it would be "challenging" for the U.S. economy to reach 4% growth anytime soon, as Trump has claimed. "There is a lot of uncertainty about what the likely effects will be, and my colleagues will be committed as always to evaluating the data," Yellen said. Yellen and Powell were among the seven committee members voting for an increase. 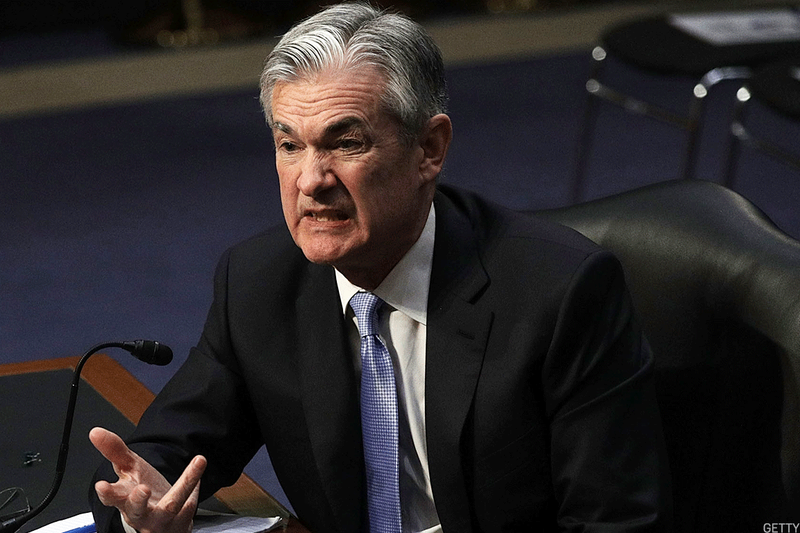 Charles Evans, president of the Federal Reserve Bank of Chicago, and Neel Kashkari, who heads the Minneapolis Fed branch, dissented from the decision, preferring to leave rates where they were, according to the statement. A gradual pace of rate hikes is warranted, according to Deutsche Bank, given the "labor market at full employment, record easy financial conditions, rising odds of fiscal stimulus and early evidence that inflation is recovering." It might not work out that way. The odds have risen that the Fed, which is supposed to maximize employment while keeping prices stable -- could need to hike more aggressively, Deutsche Bank economists wrote in a Dec. 8 report. That could bring pain for investors, who have benefited from this year's 19% rally in the Standard & Poor's 500 Index, though at the cost of an increasingly expensive market. Goldman Sachs warned investors last week that stocks and bonds are trading at the highest average valuations since 1900. Yields on fixed-income securities are still so low - the 10-year Treasury yield is at 2.38% -- that many investors are taking on increasing risks in search of bigger returns. The frenzy in bitcoin, where prices have climbed 17-fold this year, serves as a reminder of just how wacky financial markets have become. During the press conference, Yellen said that asset prices look "elevated" but that the risks to the global economy are "balanced." "There's nothing flashing red or possibly even orange," she said. "We have a much more resilient, stronger banking system, and we're not seeing some worrisome growth in leverage or credit at excessive levels."